Bridge Hydraulics and Scour Assessment - Bundle 210 Sandy River | WEST Consultants, Inc. 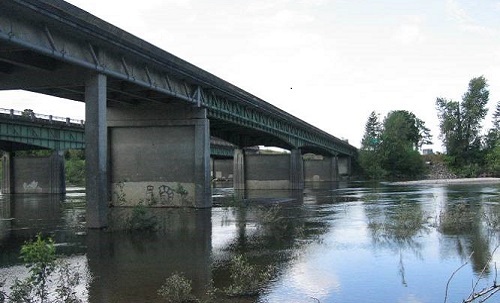 The $2.46 billion Oregon Transportation Investment Act of 2003 provided $1.3 billion to repair or replace hundreds of aging state-owned bridges in Oregon. WEST Consultants was contracted to provide hydraulic design support to OTIA Bridge Bundle 210 which included east and westbound I-84 crossings over the Sandy River. A hydraulic and scour evaluation for five bridge replacement alternatives was evaluated. The project included a site inspection, development of site hydrology, geomorphic analysis to meet the requirements of the ODOT Fluvial Performance Standard, bridge hydraulic design, scour analyses, and erosion protection design. The Columbia River is located approximately two miles downstream of the bridges. A hydraulic model including backwater from the Columbia River was developed for the existing bridges, proposed replacement bridge alternatives, and “natural” conditions. Hydraulic models of the Sandy River excluding the downstream backwater effect of the Columbia River were also developed for the proposed replacement bridge alternatives for use in the scour and riprap analyses. Additional analysis was required to evaluate the impacts of dam removal projects upstream of the bridge site. Marmot Dam is located approximately 28 miles upstream of the project site on the Sandy River. A hydraulic evaluation was performed which considered the potential future increase in channel bed elevation resulting from sediment deposition associated with the planned Marmot dam removal.